These Custom Imprinted Martini Glasses are perfect for bars, restaurants, clubs, fraternities/sororities, promotions, and much more. You can choose from four styles of Custom Martini Glasses, including our popular classic 8 oz. Cosmopolitan Martini Glass. A kiln-fired imprinting process – at heats up to 1,200 degrees – ensures that your imprints are durable and long-lasting. Your satisfaction is guaranteed when you order custom glassware from us. 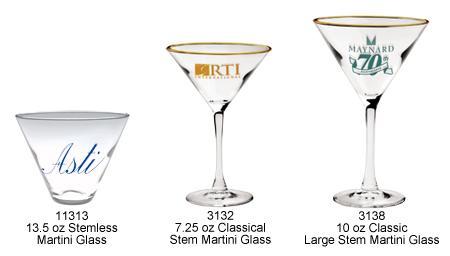 Pricing for Custom Martini Glasses – Call 1-800-233-0828 for more info or to order! 11313 13.5 oz Stemless Martini Glass $3.38 $2.99 $2.86 $2.77 $2.69 $2.51 1-1/2" 2"
3132 7.25 oz Classic Stem Martini Glass $5.12 $4.66 $4.46 $4.32 $4.19 $3.91 1" 2"
3138 10 oz Classic Stem Large Martini Glass $5.18 $4.71 $4.51 $4.37 $4.23 $3.95 1" 2"
It's easy to have your own Custom Imprinted Martini Glasses. Simply call 1-800-233-0828 and submit your camera-ready artwork to graphics@kardwell.com (you can also mail or fax your art). The minimum order is just 72 Martini Glasses. Process time is about 3 to 4 weeks. Rush delivery is available.